Gold and silver futures mixed it up Thursday, with gold down for a second straight session while silver rebounded from a more than two-week low. Gold for December delivery edged down $1, or less than 0.1%, to close at $1,166.10 an ounce on the Comex division of the New York Mercantile Exchange. The settlement is the lowest since Oct. 13 when prices ended at $1,165.40 an ounce. Gold traded from gains to losses throughout the day. "Gold is looking for leadership," Bloomberg News quoted George Gero, a vice president of global futures at RBC Capital Markets in New York. "The Fed will not be the Grinch that stole Christmas, so gold is on a waiting see-saw for now." 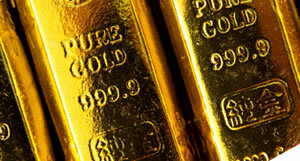 Gold prices traded from a low of $1,161.40 to a high of $1,171.80. Prices slipped 0.9% on Wednesday after rising 0.4% on Tuesday. Silver for December delivery settled up 13 cents, or 0.8%, to $15.84 an ounce. Silver prices ranged from $15.64 to $15.91. They dropped 1.3% in the previous session to close at their lowest level since Oct. 5. January platinum rose $5.80, or 0.6%, to $1,012.90 an ounce, trading between $1,000.20 and $1,013.70. Palladium for December delivery added $8.45, or 1.3%, to $685.60 an ounce, ranging from $667.65 to $686.60. Gold shed a dime to $1,167 an ounce. Silver added 2 cents, or 0.1%, to $15.77 an ounce. United States Mint sales of bullion American Silver Eagles climbed by 40,500 to 926,500 for the week and 38,986,000 for the year — a record annual pace. The U.S. Mint has limited sales of Silver Eagles since temporarily running out of them in early July. The agency allocated 970,000 coins for this week, and now 43,500 of them remain. Last year when sales ended at an annual record totaling 44,006,000, the coins by Oct. 22 reached sales of 36,066,000.